EMS Safety - is a classroom, PowerPoint, Scenario, Instructor-led course that was developed to improve safety on the job, and to help build a "Culture of Safety" within the healthcare profession and other industrial professions. The is the first national and most comprehensive education program that teaches techniques on how to best achieve safety on the job. This course focus has been expanded beyond a typical safety courses and includes all aspects of safety. 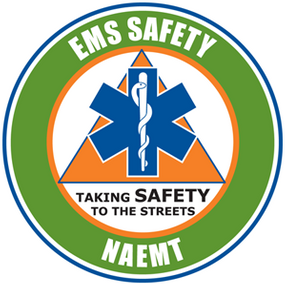 A collaborative effort between the National Institute of Occupational Safety (NIOSH), National Highway Traffic Safety Administration (NHTSA), as well as the National Association of Emergency Medical Technicians (NAEMT) worked together to develop a culture in which safety considerations and risk awareness permeate the full spectrum of activities and decisions. These efforts are an attempt to advance safety through partnerships with Federal and stakeholder associations, and helping to protect the workforce by improving injury surveillance and safety among those in high-profile projects. AUDIENCE: This course is for all types and levels of responders in emergency services, rescue personnel, EMS Supervisors and Administrators, and many other industrial agencies that require a comprehensive educational safety course as this course can be customized to fit the specific needs of the participants, including geographic areas. Content is presented in the context of realistic scenarios, large-group discussions about safety issues, and small-group exercises. COURSE FORMAT: This classroom-based course includes instructor, PowerPoint, video, and realistic scenarios interaction throughout the course. This course is approximately 8 hours in length. PowerPoint-based course to ensure continuity, consistency, and "safety first thinking"
Fundamental Principles and Concepts of "Culture of Safety"
CERTIFICIATION: Upon completion of this course, students receive a NAEMT EMS Safety course certification and completion card this is valid for 4 years.